Designed for large format Heat Presses. Sports and Fashion Apparel – Everything from t-shirts and cycling jerseys to handbags and baseball caps is a possibility. The ever-growing popularity of sports and fashion apparel opens up new sublimation opportunities every day. Heat Transfer to various fabrics. 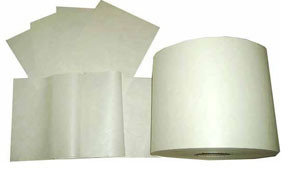 We have custom designed with several customers a specific width, length and OD of a roll just for them. We are able to change the coat weight going on to the paper as well as the moisture content of the paper. Please don’t hesitate to give us a call about your next dye-sublimation project.